MaREI have been awarded over €4m in grants for research equipment and facilities from the SFI Infrastructure fund for an Open Ocean Emulator (OOE) at UCC and a Marine Renewable Energy Remotely Operated Vehicle (MRE-ROV) at UL. This infrastructure funding was awarded competitively following rigorous international review to research groups where the research equipment and facilities are required to address major research opportunities and challenges including partnerships with industry. The Open Ocean Emulator integrates test tank developments, state-of-the-art instrumentation and electrical infrastructure such that to create the most advanced small scale model testing capability worldwide. It will complement existing facilities at the Lir Ocean Test Facility at the UCC Beaufort Building in Ringaskiddy and enhance Irelands R&D capacity. The OOE will accurately replicate real ocean wave conditions in a laboratory setting and in combination with the use of advanced instrumentation will improve our understanding on how marine structures, such as wave energy converters, floating wind turbines and tidal energy devices, behave. This advanced testing capability will accelerate the path from technology design to real-world applications and contribute to the growth and sustainability of the offshore renewable energy industry in Ireland. 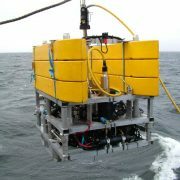 The MaREI team at UL were awarded close to €2M in funding for an MRE-ROV, a key piece of support infrastructure for the development and testing of wave and tidal energy converters and for research and development of technologies for inspection, repair and maintenance of MRE infrastructure in the challenging high energy off shore conditions at MRE farms.